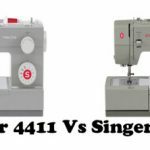 When you compare Brother SE400 and SE425, it may seem like you are getting nowhere. But if you dig in deep, there is always a choice to make. 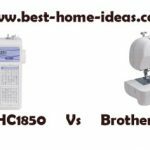 Brother SE400 is the most affordable sewing and embroidery combo machine you can get in US. The reason why this machine became so popular is its versatility and quality of stitches. The selection of stitches and features available on SE400 is pretty impressive. 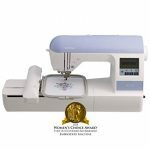 A combination of excellent price, great features and quality stitches made this machine enter our list of ‘Machines You Can Buy With Your Eyes Shut’. One interesting thing is that, Brother also released another similar machine under the model number SE425. 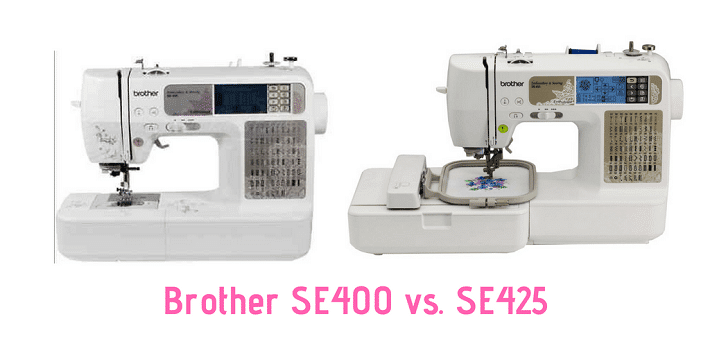 Now most people will be confused between Brother SE400 and SE425. Both are similar in features and price, so I will try my level best to help you make a choice. When you compare these two machines, the first thing you will notice is nothing. I am not joking, both machines are identical. The embroidery area (4″x4″) is the same, sewing features are the same, embroidery features are also same. The difference is in the accessories you get. Currently, SE425 is priced higher than SE400, so the decision you need to make is whether the extra accessories you get is really worth the money. 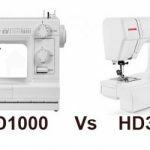 Both SE400 and SE425 come with 70 built-in embroidery designs, but with SE425 you will get an extra 100 designs on a CD. Technically speaking, you can say that SE425 comes with 170 embroidery designs (70 on the machine and 100 on the CD). In addition to the CD, you will also get two other accessories which you won’t get with SE400. You will get a Zig Zag foot and 4 bobbins with SE425. Apart from the above said things, everything else is the same. Which Machine To Buy ? First thing you need to do is, compare the price. With few extra accessories in the box, Brother SE425 will be the expensive one. If the price difference is more than $30, then I think SE400 will be a better deal. There are reasons for it. The 100 embroidery designs CD is not really great. It only comes with basic designs, I didn’t find many useful designs on it. 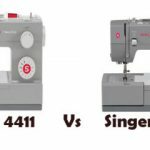 And both SE400 and SE425 come with computer connectivity, so you can import designs from iBroidery.com and other websites. So the better option will be to buy SE400 and import the designs you want, from the internet other than relying on the CD. The other extras you get with SE425 are the bobbins and zig zag foot. Both in total won’t cost you more than $20 – $30, be it anywhere in the world. So why waste your money on nothing. You can save that money to buy some accessories. My recommendation will be Brother SE400 all the time (there is an exception, read below). “BUT”, what if Brother SE425 is cheaper ? Sometimes, I have seen SE425 price drop below SE400’s. In that case, Se425 is better. So it is very important to compare the prices. The price keeps on changing.